Cloud has revolutionized the way education is delivered and available to users around the globe. It has made the education system more collaborative, Innovative and readily available to end users. It is the need of the hour to create an ecosystem where remote students and educators can be connected in real time. It thus becomes imperative to couple your LMS (Online Learning Management system) with a CRM or leverage an existing robust CRM to deliver education online. So what is LMS and what are the Basic features an LMS must have to deliver content online? A learning management system (LMS) is a software application for the administration, documentation, tracking, reporting and delivery of e-learning courses or training programs. Following are some of the must have features for a complete LMS. Content Management – Authoring the content and ensuring that it goes through review cycle is a must to ensure that quality of content delivered is always high. Robust Content management module will help design course structure, authorise and manage content. Curriculum planning– Designing course curriculum is a very important step to ensure that the student’s goals are met, be it knowledge empowerment or certification. Assessment and testing – A student’s knowledge can never be gauged till he undergoes assessments in the form of quizzes or exams. Coupling learning with assessment is good way to know where a student stands. Reports generation – Reporting and Analytics will give all parties concerned i.e educator, student, admin etc the correct preview of taking a particular course or what needs to be done to empower a student better. Communication and collaboration – Keeping communication channels open between educator and student or within the same community of students is a must to ensure smooth completion of a course. Announcements – Keeping the students abreast with important announcements ensures that information is quickly propagated. Certificate generation – Putting a seal to the course or exam taken is the final leg of an LMS. Issuing digital certificates automatically as soon as the course or exam is over is a must for any LMS. Auto assignment of queries and auto response. 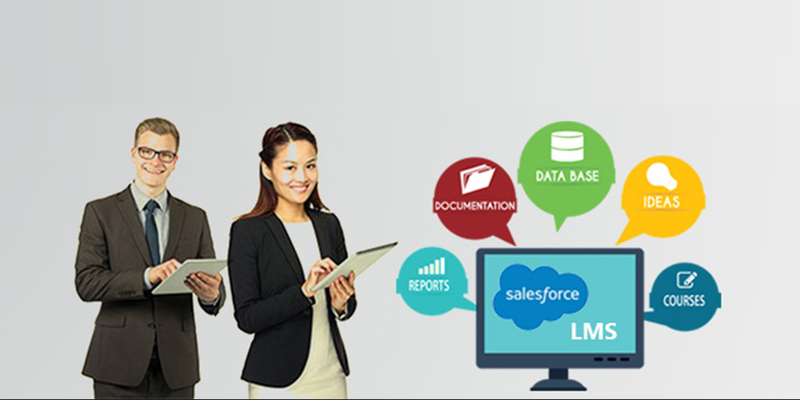 Why reinvent the wheel when Salesforce can be used to develop the LMS functionality.